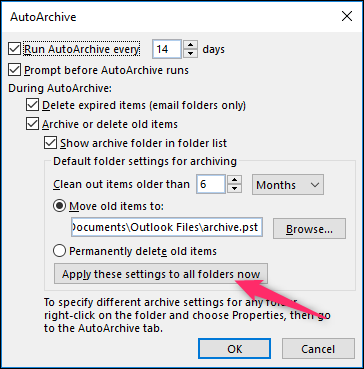 If you’ve used the mailbox cleanup tool, then you’ll have seen the AutoArchive button, but you may be wary of how it works and what it’ll do. Here’s what it does and how you can put it to use. 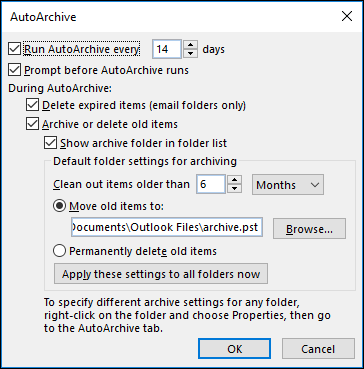 Clicking the AutoArchive button causes a process to swing through all of the folders in Outlook and apply any AutoArchive rules you’ve set up (don’t worry, the default AutoArchive rule is to do nothing, so you can’t do any harm by clicking the button). 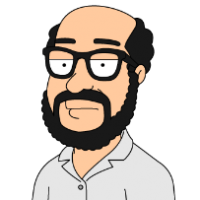 But if you want to move your older items to an archive where they’re out of the way, AutoArchive is how you automate the process. Let’s go through setting it up and running it. First, you need to turn on AutoArchive and choose its settings. Go to File > Options > Advanced and then click the “AutoArchive Settings” button. As long as the “Run AutoArchive every” option is switched off (which is the default), AutoArchive will never run. Once you turn the “Run AutoArchive every” option on, all of the options are now available. 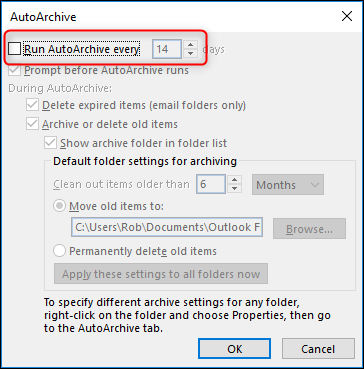 Unlike Folder Cleanup, which has one window of settings in File Options and then allows you to run those settings against any folder you like as a manual task, the AutoArchive settings shown here are the default settings. Each folder that has AutoArchive switched on can use these default settings, or you can use different settings for different folders if you want. We’ll go through how to do that later on, but for now, let’s look at the default settings. The first thing to notice is that once AutoArchive is turned on, it will run every 14 days. You can change that using the Up and Down arrows or by typing a number in, and you can select any value from 1 to 60 days. You can type in any two-digit number, but if it’s more than 60, Outlook will display an error message when you click “OK,” and you’ll have to change the value before you can save. The next option—“Prompt before AutoArchive runs”—gives you the choice of having Outlook show you a prompt before the AutoArchive happens. This prompt lets you review the settings or cancel this run of the AutoArchive if you want. The rest of the settings relate to what items will be archived, and what happens during the archive process. The first option here—“Delete expired items (email folder only)”—relates to emails which have had an expiry date added to them. This won’t affect tasks or events, even if you turn AutoArchive on for those folders. The rest of the settings apply to all items, not just email. This means calendar events, tasks, notes, and journal entries. 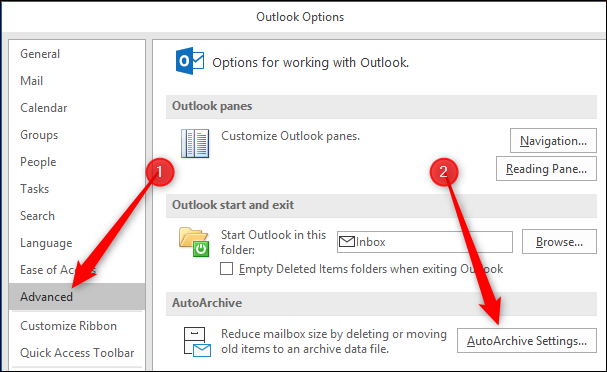 Be warned that this deletion bypasses the Deleted Items folder, and your items will be deleted from Outlook entirely. You may still be able to access it on your mail server, depending on your settings, but you shouldn’t rely on this. Only choose this option if you want to delete the items forever. When you click “OK,” AutoArchive will be turned on. It will run in line with the “Run AutoArchive every” value you’ve chosen (every 14 days by default), starting today. So once you turn it on you should expect it to run quite quickly. In our tests, it took less than ten minutes between switching it on and receiving the prompt telling us AutoArchive was going to run. AutoArchive only runs by default on a few folders, so if you want it to run on specific folders—or you want to customize how it runs on different folders—keep reading. You can also access folder properties by selecting Folder > Folder Properties in the ribbon. (For folders like Calendar and Tasks that don’t show up in the Navigation pane, this is the only way to access the folder properties.) There’s also the option to go straight to the AutoArchive Settings, which saves you a step once you’re inside the Folder Properties. 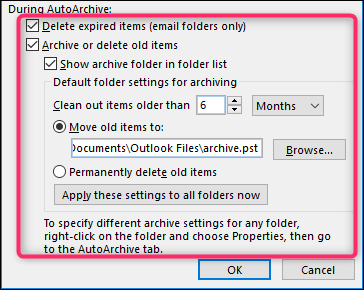 In the Folder Properties window, click the AutoArchive tab to access the settings for that folder. For most folders, the “Do not archive items in this folder” setting will be on by default. This means that when the AutoArchive process runs, the folder will be ignored and no items in it will be archived. 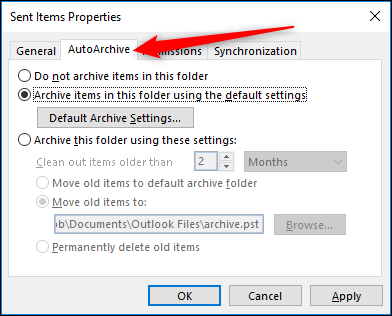 If you want the folder to be included, switch on the “Archive items in this folder using the default settings” option. Alternatively, if you want the AutoArchive settings for this folder to be different from the defaults, switch on “Archive this folder using these settings” and amend the settings to your preference. 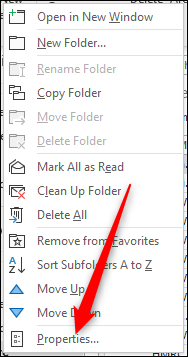 If at any point you want to return all folders to use the default settings, you can go back to File > Options > Advanced > AutoArchive Settings and click the “Apply these settings to all folders now” button. That will change all folders that have the “Archive this folder using these settings” switched on to have “Archive items in this folder using the default settings” switched on instead. Once you’ve got the AutoArchive default settings, and the settings per folder, set up the way you want, you can leave the process to quietly work in the background, freeing up space for you and keeping your folders from getting too bloated.